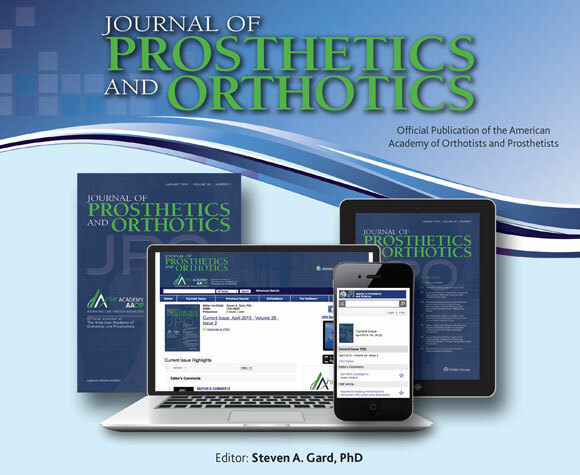 The mission of the Journal of Prosthetics and Orthotics is to promote, enhance, and disseminate information pertinent to the science and practice of prosthetics and orthotics. As the leading peer-reviewed journal in prosthetics and orthotics, it presents developments in clinical practice, research, education, and technology. The journal is seeking papers for publication to fulfill its mission statement. Articles are accepted with the understanding that the manuscript has not been published previously, nor is being considered for publications by any other print media. Instructions for Authors appear in each issue. Content of submitted manuscripts can focus on clinical case studies/series that describe innovative approaches for fitting prostheses and orthoses, a review of current literature on a clinically relevant topic, a technical note about a new component or fitting technique, or a description of original research/development in the field of prosthetics and orthotics.